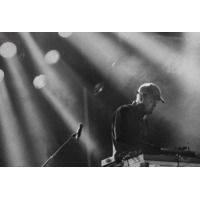 Joshua Paul Davis (born June 29, 1972) better known as DJ Shadow is an American music producer, DJ and songwriter. He is considered a prominent figure in the development of instrumental hip hop and first gained notice with the release of his highly acclaimed debut album Endtroducing....., which was constructed entirely from samples. He has an exceptionally large personal record collection, with over 60,000 records.